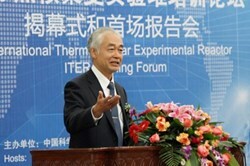 Osamu Motojima giving his speech at the newly founded ITER Training Forum at the School of Nuclear Science and Technology (SNST). 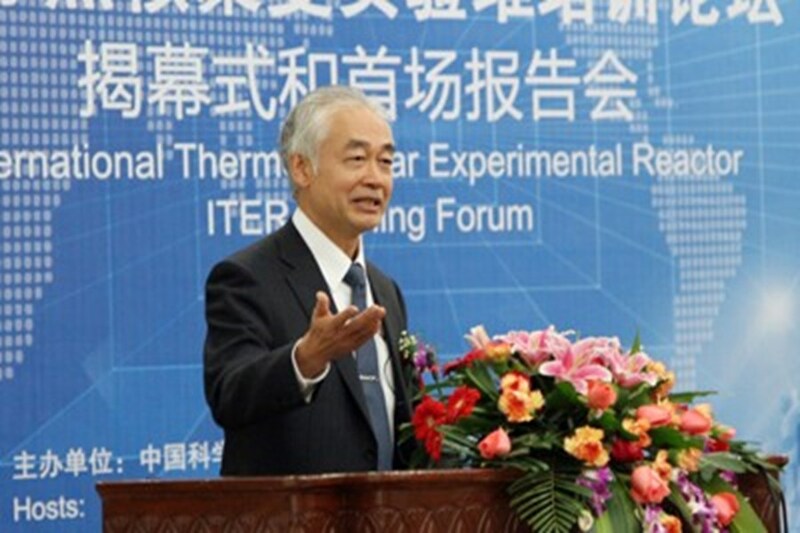 The ITER Organization and the University of Science and Technology of China (USTC) have signed a Memorandum of Understanding "to promote cooperation and exchange in all academic and scientific fields of mutual interest and to advance the training of young fusion researchers." As one of the top-ranking universities in China, USTC encompasses an extensive range of disciplines and experts in various fields of relevance to the development of fusion power. The parties agreed on establishing an ITER Training Forum at the School of Nuclear Science and Technology (SNST) which forms part of the USTC. The ITER Organization is expected to send five to ten experts each year to SNST to provide a series of lectures which will be presented over a period of one week. Each lecture series is intended to be in line with the domestic education programs. Young scientists, engineers and project managers from the international fusion program will be encouraged to participate. The first ITER Training Forum will provide an overview of the ITER project and will, in addition, focus on various technical and physical topics ranging from ITER operation, to the deuterium-tritium fuel cycle system design, to IDM. In addition, the ITER Organization may accept up to ten senior doctoral students or postdoctoral researchers chosen by SNST and approved by the ITER Organization each academic year in compliance with the ITER Internship Program Policy. The students and postdoctoral researchers will gain experience through working with the ITER Organization experts and participating in the daily activities of the host unit. They also will receive practical training in exploiting their skills by analyzing and solving specific problems under the guidance of ITER Organization supervisors. The initial duration of the internship at the ITER Organization will be 12 months with a possibility of extension for a further period of up to 12 months. For more information on the program, please contact David.campbell@iter.org.